I was thinking the other day about what a vampire-in-space story would look like. Many stories feature vampires who are hundreds of years old, but as far as a specific title featuring a (non-alien) vampire in a far future setting, with romance, none are coming to mind. I would definitely check out such a story, but at the same time, I think it'd mess with my mind, LOL! I guess a lot would depend on the execution, and the mindset toward the supernatural in that time period. What kinds of themes could be explored in such a story? Lo and behold, in December, Marlene Harris, the super librarian behind Reading Reality, tipped me off about Nina Croft's BREAK OUT (Entangled Publishing). This novella features a vampire in space and is the first book in the author’s Blood Hunter series. Naturally, I had to check it out. I was interested in seeing what an author might do with a supernatural vampire in a futuristic setting. What follows are a few (non-spoiler) thoughts I had about the vampire-in-space component. I went into this story only with the expectation that it deliver a space opera setting, a supernatural-based vampire, and a romance. Because vampire-in-space romances are so rare, I figured the story could go anywhere. It could be action-adventure, I thought, or character-driven, and in terms of tone it could be lighthearted, or full of darkness, violence, and angst. Tone-wise, BREAK OUT is a lighthearted action-adventure space romp. The focus, as the blurb indicates, is clearly on the fun. As a vampire living in the far future, Rico has emotional baggage, but he’s not that angst-driven. In fact, he seems to have adjusted fairly well. Given his history, he’s a Friend of Old Earth, so there are Old Earth references and at one point he teaches Skylar and his crew how to play poker (with actual cards--no holographic card deck for him!). In terms of mythology and the mindset toward vampires, I noticed a couple of things. One, he’s still a myth in that world. Enough time has passed that humanity seems to have finally abandoned its obsession with vampires. :P He’s a known space pirate, but people like Skylar have only heard whispers about his true nature. On the other hand, his crew knows exactly what he is. He bares his fangs a time or two and has glowing eyes. Rico fits right in with the motley crew since some of them have been genetically modified, resulting in different skin pigment and eyes, for example. The story seemed to convey that he’s only somewhat concerned about hiding his true nature. For example, he wears sunglasses to conceal his eyes (which conceivably be knocked out in a fight), and he has sucked the blood of many lovers, some of which could presumably talk about their experience. He’s perceived of as a supernatural monster by his crew, but also a safe one who is (mostly) in control of his cravings. I want to say that the story basically conveys the idea that Rico has been considered a monster no matter what time period he inhabits. Beyond that, however, there wasn’t any further social commentary that I could discern (but that didn't seem to be the story's focus, either). Still, I was curious. Was he tired of hiding or of being hunted? Was he interested in helping to change the perception of those who are different (e.g., genetically modified or immortal from Meridian)? In fact, Rico has the potential to become a real political figure/freedom fighter in this universe. I wouldn’t have minded if the story explored those themes more. Frankly, given the scope, BREAK OUT could easily have been novel-length. I’m not sure BREAK OUT addressed the “what if?” of a vampire-in-space beyond a few basic worldbuilding elements; however it takes itself seriously enough that I was able to suspend my disbelief. Again, the focus seemed to be on the fun and so early on I adjusted my expectations accordingly. As far as the romance between Rico and Skylar, it struck me as fairly traditional, which might make BREAK OUT a possible gateway story for paranormal romance fans interested in giving science fiction romance a try. One element that the blurb doesn’t mention is the role of the “Church of Everlasting Life.” This church opposes the use of Meridian, and they aren’t too keen about vampires, either. I had mixed feelings abut the church angle. On the one hand, it makes complete sense that a group of people would object to Meridian. On the other hand, I'm not entirely convinced that it had to be a religious group. That felt too recycled to me, that a vampire in the far future would still have to contend with a religious antagonist. I found myself thinking, gee, it’d be cool if a rival pharmaceutical corporation went after Rico to get his blood and study his body chemistry to see if they could isolate the immortality element—all with the intention of making an immortality drug from it, albeit without the vampire side effects. BREAK OUT seemed to lay the groundwork for that kind of plot point. Maybe I’m a bit jaded, though, because the vampire-Church conflict is one I’ve already encountered multiple times in the horror genre. Your mileage may vary. And one could easily argue that different kinds of religion will undoubtedly be a part of many cultures for hundreds and even thousands of years to come. So from that perspective, featuring a religious antagonist is a valid approach. But hey, this is the age of ebooks—authors can take all kinds of approaches! It’s not a question of either or these days. Sweet. For more information about Nina Croft’s Blood Hunter series, Marlene Harris of Reading Reality posted reviews of both BREAK OUT and of DEADLY PUSUIT for your reading pleasure. 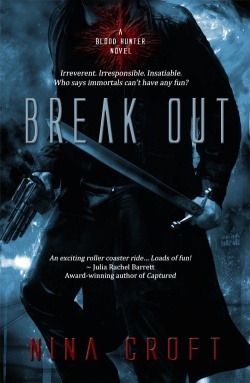 And the Kindle edition of BREAK OUT is only 99 cents at Amazon as of this post. Double sweet! Do you have any expectations for a vampire-in-space romance? Are there certain elements you would like to see included (or excluded) in such a story?